August 2016 – During our RV travels in Utah we have had many unique and memorable experiences, and one particularly delightful encounter was when we met Martin Tyner of the Southwest Wildlife Foundation back in 2008. 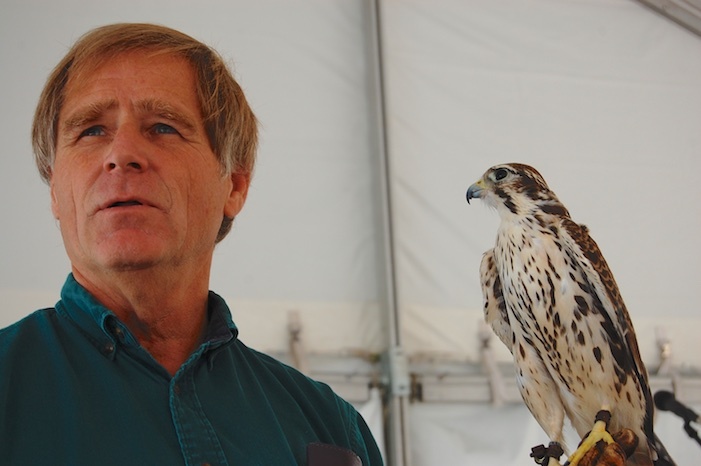 Martin is one of America’s top master falconers as well as a native animal rehabilitation specialist. He revives ailing creatures that have been found and brought in to him, and he releases them back to nature. Into the wild — with prayers! Those animals that can’t be released become part of his education program where he teaches young and old, both far and near, about the beauty and wonder of Nature’s creatures. Back in 2008, we watched Martin’s heartwarming presentation of several rehabilitated raptors during the Iron County Fair in Parowan, Utah. 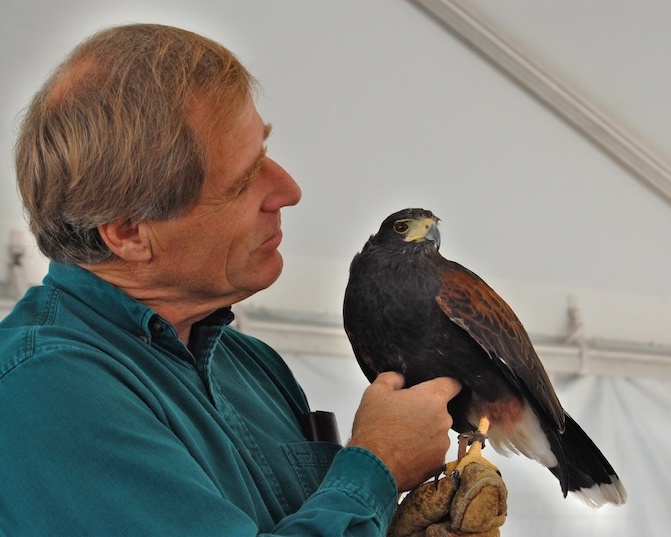 His gentle manner with these big, beautiful, birds of prey was remarkable, and his tales of healing countless injured and sick birds over more than four decades were extraordinary. Years ago, Martin had a unique encounter with a Native American spiritual leader, Clifford Jake, and he learned that the Paiute Indians have long believed that a prayer said over an eagle feather is carried directly to the heavens. To them, eagles are angels who fly between the human world and the Great Spirit. Martin had the idea that since an eagle has 7,000 feathers, it can carry 7,000 prayers when it is released into the wild after being nursed back to health, and he has been releasing eagles carrying special prayers to the gods ever since. In recognition of his gift nurturing eagles, spiritual leader Clifford Jake held a special ceremony and gave Martin a Paiute name which means Healer of Angels. 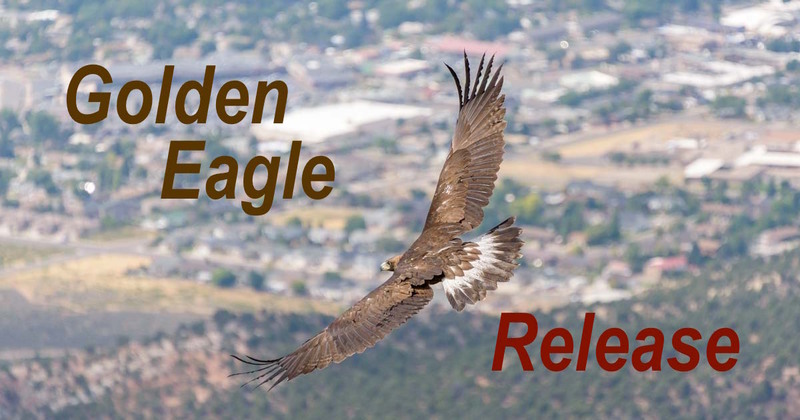 After we watched Martin’s bird presentation all those years ago, we found out he was going to release a rehabilitated golden eagle a few days later. 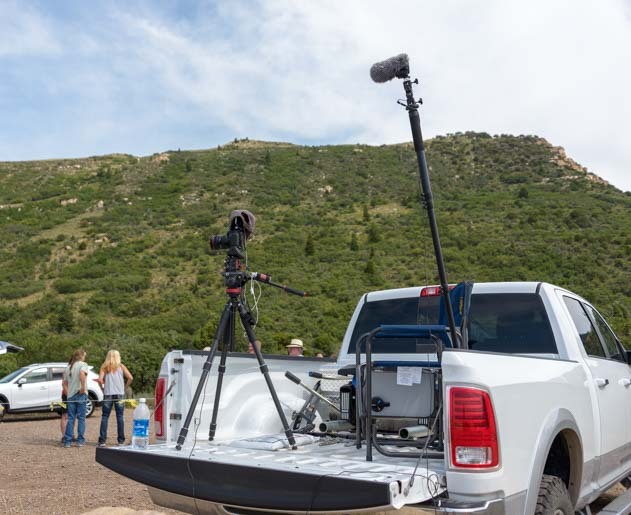 He was gathering together Utah’s “downwinders,” that is, cancer survivors who have suffered the ravages of disease caused by being downwind of the nuclear bomb testing that took place next door in Nevada in the 1950’s. This eagle would carry the community’s prayers for their health and healing up to the heavens. Unfortunately, we couldn’t stay to see this unusual event, and we left the area heartbroken to have missed it. 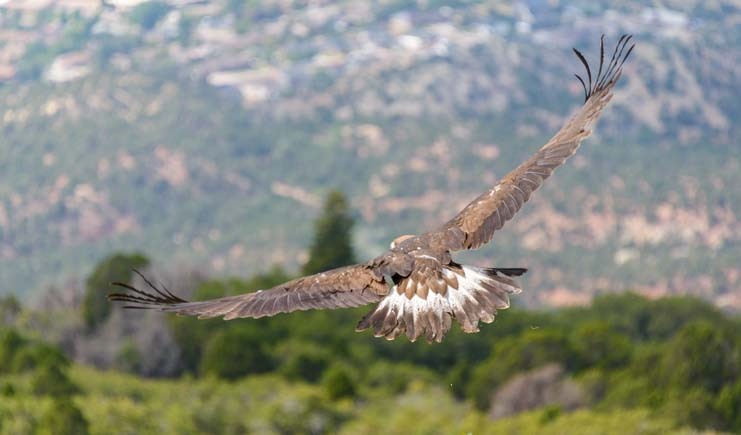 However, we got onto the Southwest Wildlife Foundation newsletter mailing list, and we have wistfully watched announcements of raptor releases from afar ever since. 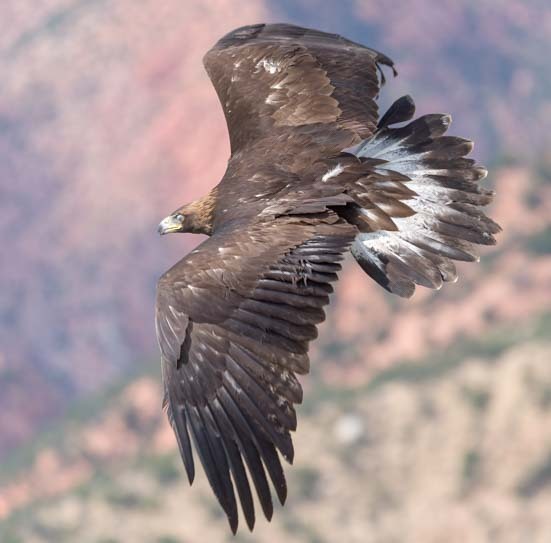 Miraculously, just as we brought our RV into Cedar City, Utah, in late August this year, we received a Southwest Wildlife Foundation newsletter email announcing that a golden eagle would be released from a mountaintop outside Cedar City in a few days. This eagle would be carrying prayers for America’s First Responders who put their lives on the line everyday despite ever increasing violence in the streets. We were thrilled! On the appointed afternoon, we drove up to the parking area on the mountain and found that a crowd was gathering and excitement filled the air. 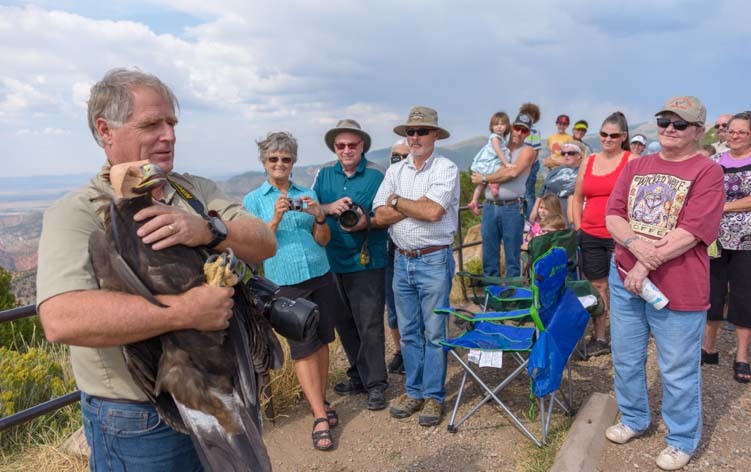 People were waiting on the mountaintop for the much anticipated eagle release. A videographer had set up cameras to capture the release on video so it could be streamed live on Facebook! The view from the mountain looked out over gorgeous red rock hills in the distance and Cedar City far below. 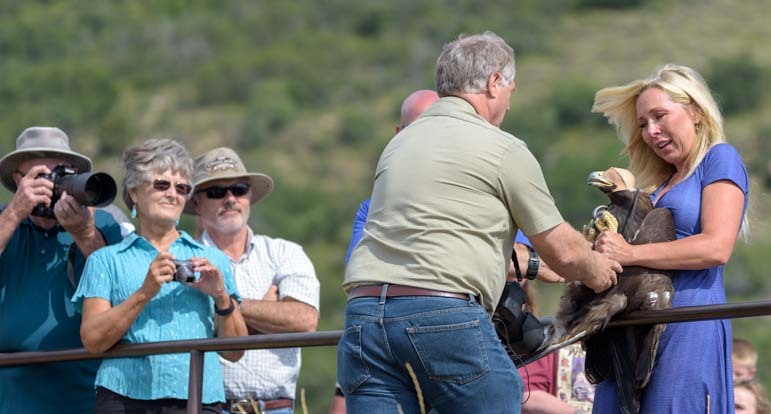 People were staking out spots all over the place to get a good view of the eagle as it returned to its home in the wild. 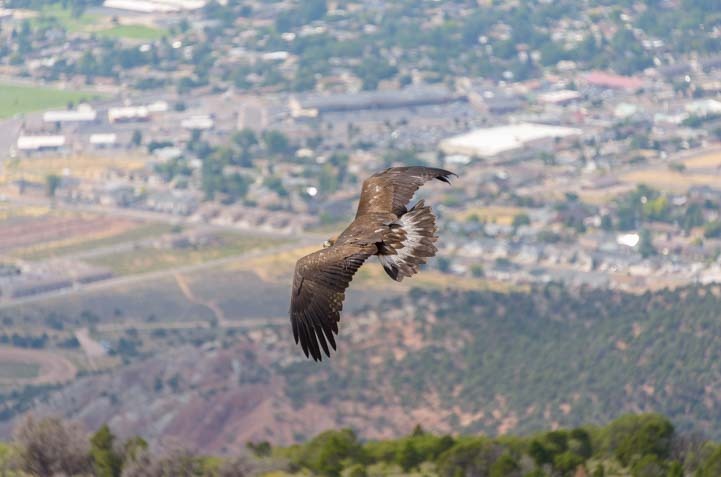 An eagle eye’s view over the red rock mountains outside Cedar City. 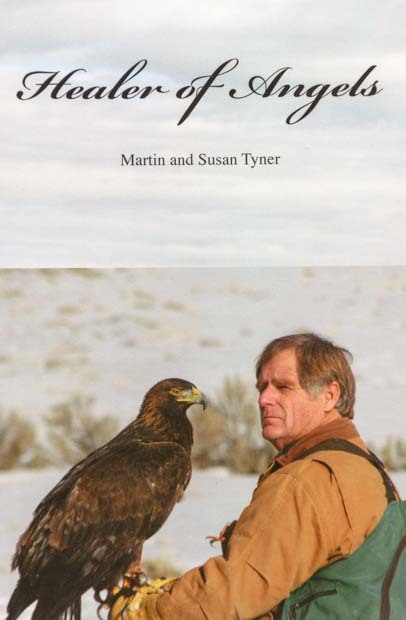 Martin Tyner has written a delightful book about his journey to becoming one of America’s top master falconers and wildlife rehabilitators, called Healer of Angels. As I read his hilarious and deeply touching stories about his boyhood and young adult years, I found myself alternately laughing aloud and wiping away tears. Martin Tyner’s heartwarming autobiographical stories! Anyone who has a soft spot for animals will absolutely love this book! A native of California and a true lover of nature as a youngster, Martin nursed an orphaned baby barn owl when he was just twelve and soon began receiving all kinds of injured animals from friends, neighbors and even the game warden to care for. As a teenager he apprenticed himself to Hubert Wells of Animal Actors of Hollywood who taught him the ins and outs of training elephants and big cats. Then he became the Curator of Birds of Prey at Busch Gardens in Van Nuys, California. Whether it has two wings or four legs, big teeth or fierce talons, or even a tiny hummingbird’s beak, Martin knows how to take care of it. 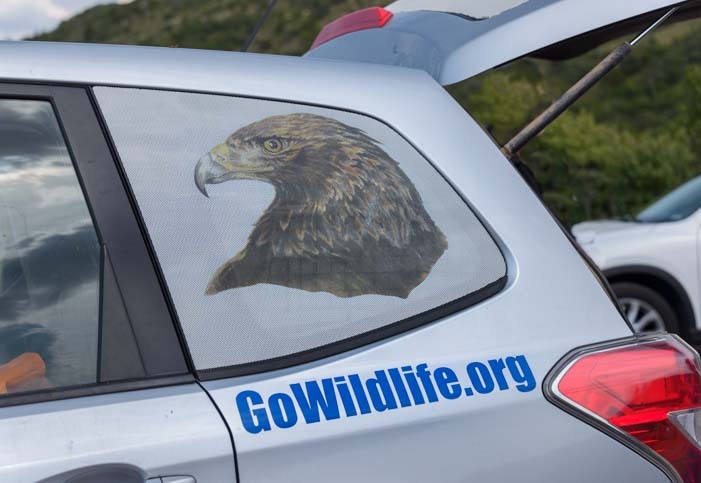 Here on the top of this mountain above Cedar City the crowd quickly parted when Martin showed up in the Southwest Wildlife Foundation’s cool Subaru wagon. Martin arrived with his special cargo in the back. His precious cargo was with him, and he swung open the tailgate to reveal the eagle’s carrier. The lucky golden eagle was waiting patiently inside her carrier. Martin had spent the last month bringing this golden eagle back to vibrant health after she was found nearly dead during a massive heat wave in July. 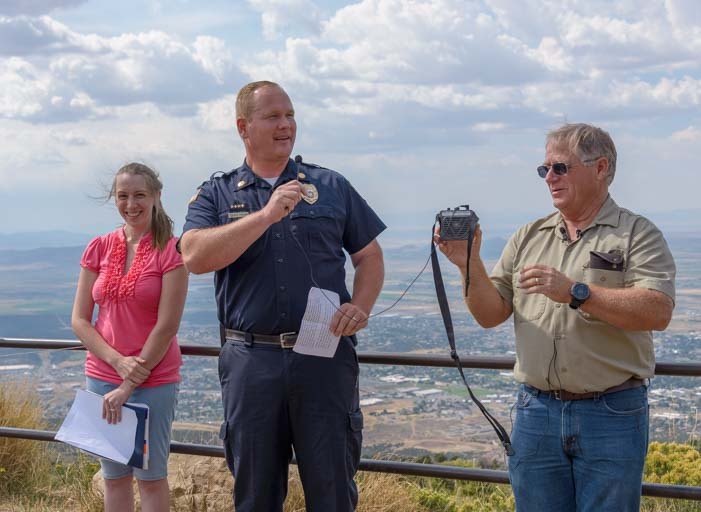 Because the Southwest Wildlife Foundation was dedicating her release to First Responders, the event was well attended by the local police, EMTs, sheriffs and others whose job it is to run headlong into danger when chaos and violence erupt in the community. Several representatives of each group gave speeches, and Lisa Hendrickson from Southwest Wildlife Foundation read aloud a letter written by Ken Osmond, the actor who played Eddie Haskell on the TV show Leave it to Beaver. As the former actor explained in his letter of support for the Foundation’s eagle release, he had spent his early adult career as a policeman in LA, and he had been shot, nearly fatally, on two different occasions just a few months apart. First Responders share their deep appreciation for this unique event. Then Martin headed over to the car and brought out the guest of honor. The guest of honor arrives. The eagle’s eyes were covered with a leather hood to keep her from getting too stressed out by all the people. 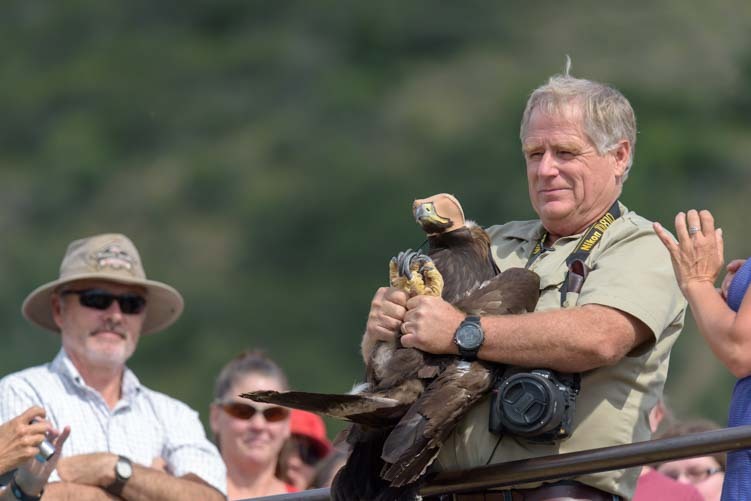 As Martin carried the eagle to the release spot, he explained that they have eyesight that is phenomenally better than ours. An eagle can spot a jackrabbit from 5 miles away! So, it is easy to imagine that if this eagle suddenly found herself surrounded by people staring at her, she would have been terrified. She was much calmer with her little blindfold on. 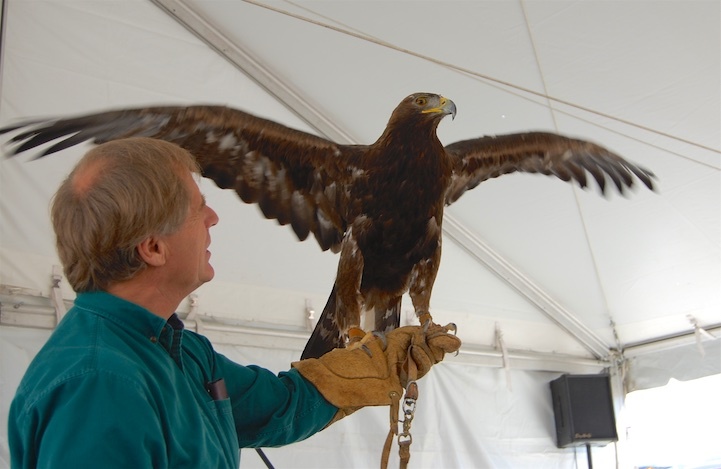 Martin told us a little about the eagle’s history and her amazing capabilities. Martin went on to tell us that eagles are extraordinary hunters. They dive from enormous heights and grab their prey with their feet. And what amazing (and huge!) feet they have!! 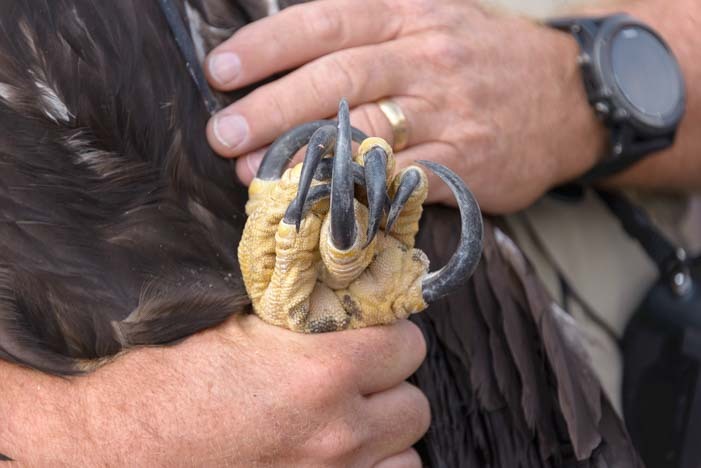 I wouldn’t want to be a rabbit looking up at these talons! Martin was the first falconer ever licensed to keep an eagle for falconry, and the golden eagle he worked with, named Bud, was his constant companion for fifteen happy years. Martin would take him out hunting a few times a week, not to get food for himself but to get dinner for Bud and keep his hunting skills sharp. Martin would run ahead flushing rabbits out of the underbrush while Bud would soar high above and wait for the right moment to dive. An eagle’s hit rate isn’t as good as you might expect, however! Martin found it took about 40 rabbit flushings for Bud to score a meal. And the bird clearly had his human companion well trained to help him out!! Martin sets up at the release spot. Turning to a woman by his side, Martin introduced Nannette Wride, the widow of Sgt. Cory Wride who was shot and killed in the line of duty two years ago. Representing all the First Responders who have died as well as their loved ones left behind, Nannette took the microphone for a few moments and told the most touching story. Nannette’s husband was tragically shot and killed by a couple that turned out later to be on a wild crime spree. He had simply been checking on a seemingly abandoned pickup truck. The pickup truck was on the side of the road in Utah near, of all places, Eagle Mountain. Shortly after her husband’s death, Nannette began having dreams about him. In one dream he brought an eagle to her and set it on her arm, and it walked up and sat on her shoulder. He told her this eagle would watch over her and protect her until she could be with him again. 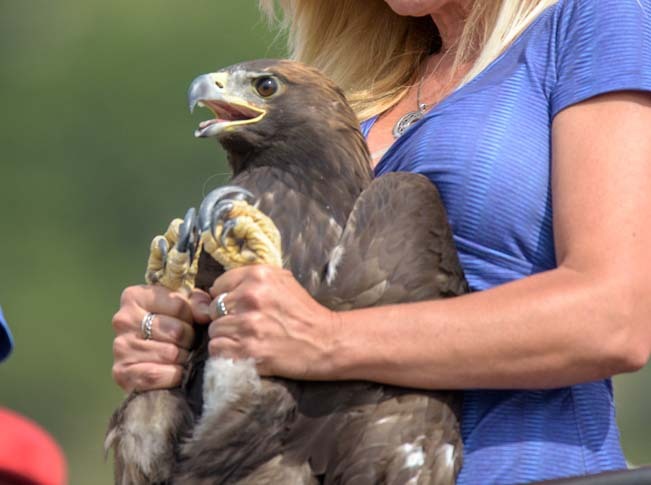 Understandably, she was utterly astonished when she got a call from Southwest Wildlife Foundation the day before this eagle release asking her to be the one to hold and release the eagle, carrying prayers for all of America’s First Responders and their loved ones. A shiver ran up my spine as she said this and I felt tears in my eyes. All around me, people were wiping their eyes too. Martin gently placed the eagle in Nannette’s arms and showed her how to hold the eagle by the legs and then release her by pushing her away. 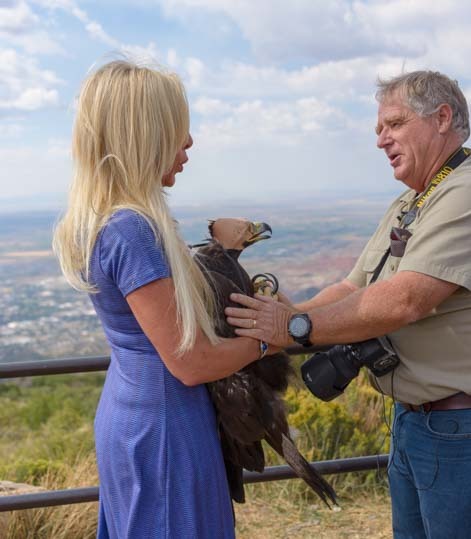 Martin places the eagle in Nannette’s arms and explains how to release the bird. “I have my eagle now,” she whispered through tears. “You have your eagle now,” he said gently. Martin untied the hood on the eagle’s head and asked us all to say a prayer to send up to the heavens with her. Then suddenly Nannette let the bird fly while everyone held their breath. 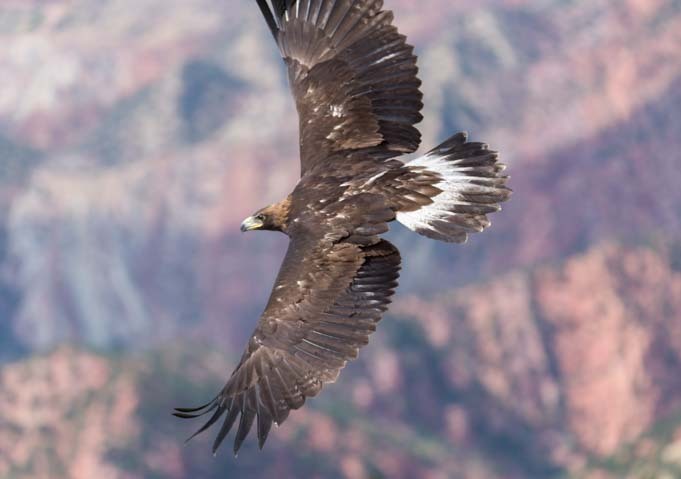 The eagle stretched her feathers across the air currents, flapped her powerful wings, and joyfully took off. 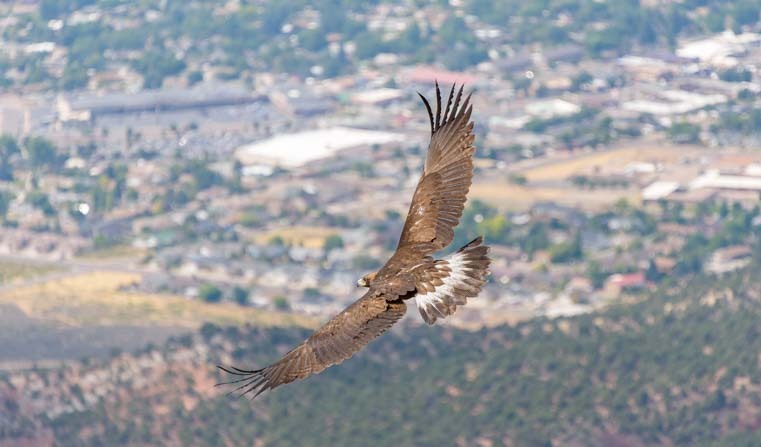 Flying far out over Cedar City, she flapped once or twice more, banked left, and then soared out of sight. 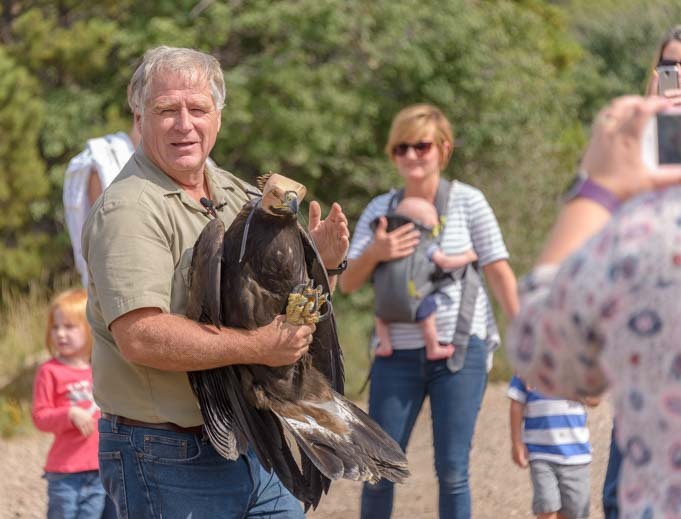 The focus of this eagle release was on gathering people together in support of America’s First Responders. But the real hero, to me, is Martin Tyner and his foundation. Martin has worked tirelessly for 48 years nurturing Utah’s native wildlife and returning the animals back to nature. The ones who can never fend for themselves again in the wild — the birds with broken wings and other disabilities — he uses for educational purposes. 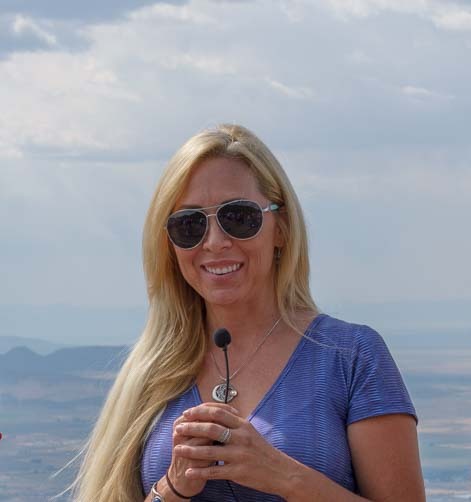 The Southwest Wildlife Foundation holds 100 educational events every year and reaches 30,000 people with their message of healing, teaching and conservation. However, Martin has bigger dreams. 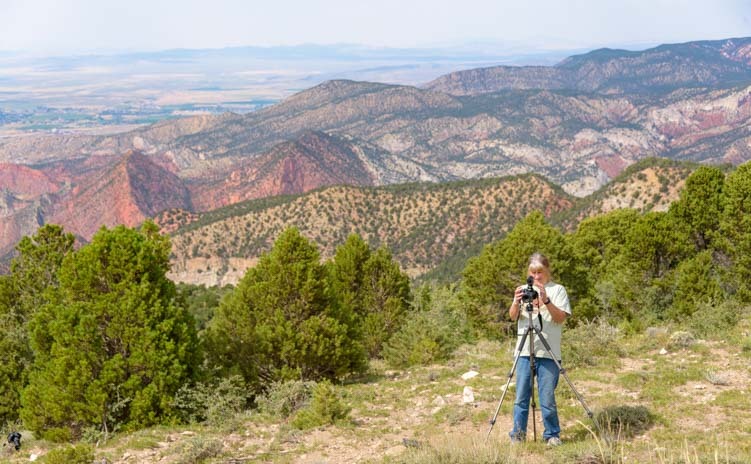 He wants his Foundation being able to build the Cedar Canyon Nature Park and wildlife rehabilitation facility just outside Cedar City. 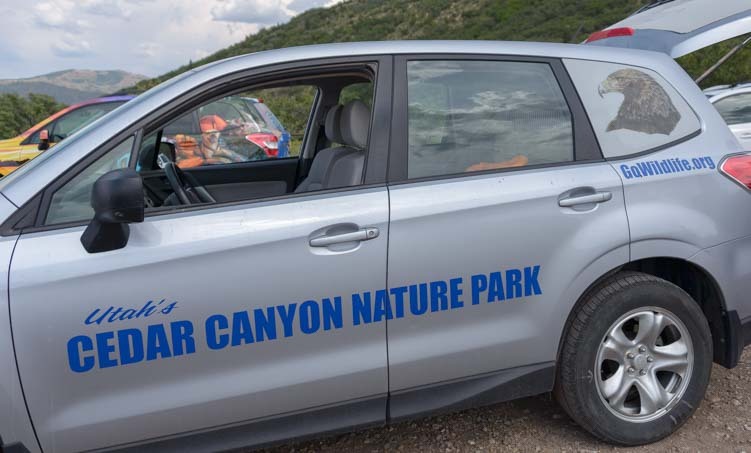 By a series of miracles, the Southwest Wildlife Foundation has been given a beautiful piece of property in Cedar Canyon that lies at the end of the paved bike path coming from town. This property will become the Nature Park and rehabilitation facility he envisions. However, Southwest Wildlife Foundation doesn’t yet have the funds to build the park, despite energetic efforts to raise money. Of all crazy things, they don’t qualify for Kickstarter funding because they are a non-profit organization. One easy way to contribute to this unique park and facility is to buy Martin’s book, Healer of Angels. It is available on Amazon too, but the Southwest Wildlife Foundation receives only $1 when it is purchased through Amazon. So, buy the book directly through the SWF website here and the entire purchase price except shipping and handling will go towards the Nature Park! The inside cover of the book is signed with a footprint from Martin’s golden eagle, Scout. How cool is that?! The Foundation also sell t-shirts and donor plaques that are placed on the Memorial Bridge at the Cedar Canyon Nature Park property. 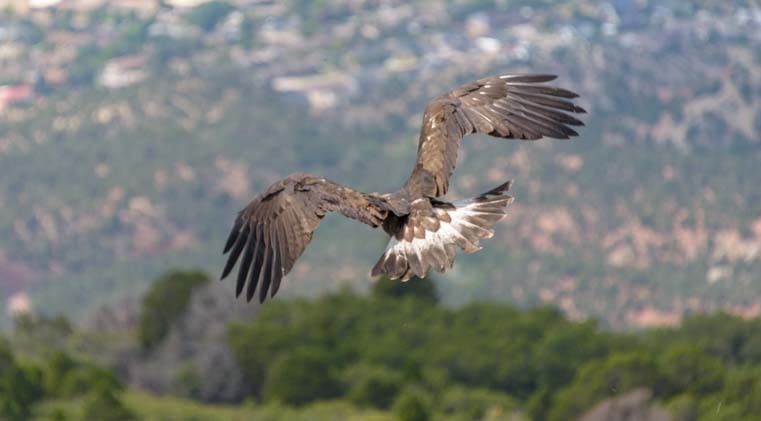 If your RV travels ever take you along I-15 through Cedar City, Utah, experiencing one of these wild raptor releases is something you will never forget. The way to find out when they are is to sign up for the Southwest Wildlife Foundation newsletter. This entry was posted in Utah and tagged Birds, New, Travel, USA, Utah, Utah Southwest, WP Travel by Roads Less Traveled. Bookmark the permalink. You are welcome. This story was a joy to share. Great story! The world is full of amazing people who do amazing things that we never hear about. Thanks for sharing his story. That’s the pure joy of being out here traveling around, Ed! I’m glad you enjoyed the story. What a moving and beautiful post. Thank you for sharing and opening our eyes to this wonderful work being done! You are so welcome, Emily. Thank YOU for reading and appreciating!!! Eagles are such majestic creatures!